Birthday 75 for the Golden Gate Bridge. 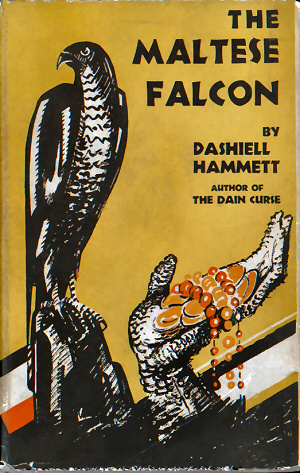 Birthday 118 for Dashiell Hammett. . . .
What to do for the birthday this year? How about something Hammettesque I’ve never heard of before? I checked some sources, not a mention — as far as I know, this is news. The Christopher Columbus figure in this story is Sue Montgomery, from the first walk this month. On that one, a chunk of people who were obvious big Hammett fans — two or three guys who’ve been on the walk before, several had their copies of The Dashiell Hammett Tour book. One of the guys returning reminded me that he had had the Unabomber as a math teacher in Berkeley — and the others knew who he was from the blurb I gave him in the back of the tour book. The guy who had the Unabomber as a math teacher! In a way, it was the meta-tour to end all meta-tours. Sue had a question for me — Did I know why Hammett put in a reference to Casper Gutman and his daughter in The Maltese Falcon long before Sam Spade possibly could have known about them? I presumed she’d misread something, but told her I’d look into it. One guy pulled a copy of the novel out of his backpack and handed it over (these people were serious). Okay. So where did the reference occur? Near the end of Chapter V The Levantine. . . . Okay, looking. . . . Next to last page, what the hell, there it is! Obviously he doesn’t yet know Gutman’s full name — not until the next chapter, The Fat Man. In Chapter XIV La Paloma Spade “went to the Alexandria Hotel. Gutman was not in. None of the other occupants of Gutman’s suite was in. Spade learned that these other occupants were the fat man’s secretary, Wilmer Cook, and his daughter Rhea” — first time in the text that the daughter Rhea is mentioned. Easiest guess: somewhere in the writing process Hammett lost track of where he was and dropped the Casper/Rhea bit in much too soon, and no one noticed. I checked the original pulp version from Black Mask to see if any juggling from that text to the Knopf text could have caused it — no, nothing. The same lines appear in the pulp, same place in the action. In short, I think Sue Montgomery has noticed a big plotting error in a recognised classic — and Happy Birthday, Dash! Sure, I can explain it away — Spade just tosses the info about a guy with a daughter out as a shot in the dark, fishing for information. Didn’t mean anything. Just stirring the pot. And if it does mean something, if on some level Hammett meant for Spade to have this uncanny knowledge of Casper Gutman and Rhea, then it would have to go to some deep, deep level — the sort of speculation that would make a person think that Wilmer Cook and Rhea Gutman are the same person, that sort of thing. But in any case, it’s something any Hammett fan ought to have fun thinking about. This entry was posted in Dash, Frisco, Lit, News, Tour and tagged Black Mask, Casper Gutman, Falcon from Knopf, Golden Gate Bridge, Guy Who Had the Unabomber as a Math Teacher, Hammett Tour Book, Rhea Gutman, Sam Spade, Sue Montgomery, Unabomber, Wilmer Cook. Bookmark the permalink.